Stoneware; transfer; 2.0L, 1.5L, 1.0L, 0.75L or 0.5L; pewter lid. The example shown at the right was produced using a relatively unusual transfer technique. After the pattern was applied to a dried but unfired vessel, the areas to be highlighted were painted with liquid wax. The vessel was then dipped into a cobalt oxide “smalt”. In the kiln, the wax burns away, allowing the design to show through in the natural gray color of the clay on a blue background. 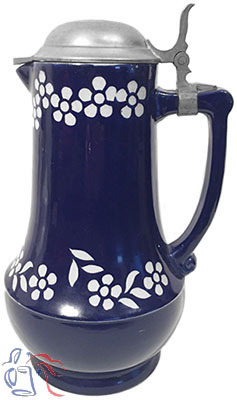 Other examples of this model (not currently shown) typically have cobalt blue coloring around the bottom portion and a variety of Art Deco transfer decorations applied to the lighter upper area.